You may have been hearing about an Instant Pot and wondering what all the hype is all about. Instant Pot is the brand name for a popular programmable multi-use pressure cooker. Also known as a multi-cooker, depending on the model you select, it can perform up to 7 cooking functions in one counter top appliance: Pressure Cooker, Slow Cooker, Rice Cooker, Saute Pan, Steamer, Yogurt Maker and Warmer. Instant Pots have been taking Canada and Europe by storm as people favor the counter-top convenience and the multi-cooker functionalities. The Instant Pot revolution is now starting to catch on like a wild fire in the United States. The programmable pressure cooker feature of the Instant Pot is the most popular cooking functionality of the appliance. Pressure cookers today are much more advanced in technology and easier to use compared to when my mother used a pressure cooker back in the late 70’s early 80’s. I recall an evening where our food exploded out of the pressure cooker and stuck to the ceiling! After that, my Mom became intimidated by her pressure cooker and was afraid to continue using it. It just ended up collected dust in the cupboard. The real beauty of today’s pressure cookers is they are safer to use without the risk from the older manual pressure cookers. It is so convenient on how fast a meal can be cooked when you need to get dinner to the table quickly. If you are like me, I constantly forget to plan ahead to pull meat or a frozen meal out of the freezer to thaw. When you get home, you can still throw frozen food in the pressure cooker for a fast dinner. I was amazed at how quickly I was able to cook frozen chicken breasts in 15 minutes or a whole chicken in 30 minutes. I was also won over when my hard boiled eggs were cooked in 3 minutes! Many people also enjoy how quickly they can cook one pot meals with beans, soups and, stews. A tough piece of meat like brisket or corned beef can be cooked in less time with fall apart tender results. If you like to meal prep for the week ahead or freeze meals for later, you will get so much use out of the multi-use pressure cooker! Prepare Meals Faster – Save up to 70% time and energy efficient! Prepare Meals With Frozen Food – No more worries if you forget to take the meat out of the freezer to thaw ahead of time. One Pot Meals – Can thaw, saute and cook in the same pot. Reduces the cleanup! Program the starting time for the meal – Program your meal to be finished cooking when you are ready to eat. Breakfast ready when you wake up or dinner ready when you walk in the door! Convenient 14 Built In Programs – Help take the guess work out of cooking times for different foods. Making Healthy and Tasty Meals – Preserving nutrition from natural ingredients. Pressure cookers are designed to cook food faster than conventional stove top and oven cooking methods and they are energy efficient. When water or another liquid boils in an enclosed pressure cooker it builds up pressure. The trapped steam has no where to release so the internal pressure increases and allows the temperature inside the pressure cooker to rise above the regular boiling pot of water. The regular boiling point of water is 212 degrees F. Inside a pressure cooker, liquids can boil up to 250 degrees F. This higher heat helps food cook faster. The higher pressure also has the benefit of forcing liquid into the food which creates more moisture and helps food cook quickly. Tough meats become fall apart tender and full of flavor. When the food is finished cooking a valve is opened to slowly release the pressure so the lid can be safely removed. Adding liquid is essential for pressure cooking to help the foods come to pressure and cook quicker than conventional cooking methods. Depending on the brand of pressure cooker, most require a minimum of 1 1/2 cups water or liquid. The Instant Pot brand pressure cooker requires a minimum 1 cup of water or liquid to be added in the pot in order to come to pressure before it cooks the added food. To prevent foods from bubbling up and clogging valves or interfering with the lid, the Instant Pot and most electric pressure cookers provide safety guidelines for fill level limitations. If the pot is overfilled and valves become clogged, the pot can continue to dangerously build pressure beyond the pressure cooker’s ability. I purchased a 6-quart Instant Pot and I am finding, due to the fill level limitations, that I would now like an 8-quart instant pot for cooking larger quantities. No more than 1/2 full when cooking foods that expand or foam up such as rice, beans, dried vegetables and oatmeal. No more than 2/3 full for all other food items. Step 1: Make sure the selected pressure cooking program has completed or press the Keep-Warm/Cancel button at any time to end the cooking program. Step 2: Release the pressure by using one of the following options. Quick Releases (QR) – Immediately and carefully open the steam valve (turn the valve to Venting) after the programmed cooking time has completed. This usually takes a couple of minutes to release all the steam. (I quickly learned to use my hand or a utensil to open the valve from the front and turn it towards me. The first time I reached from behind to open the steam valve and was hit by hot steam!) Tip: To prevent any damage to your above cupboards, make sure to position the pressure valve away from your cupboards when releasing steam. Natural Pressure Release (NPR or NR) – Pressure cooker will automatically release pressure within 10 to 15 minutes after cooking time is complete, then it goes into an automatic warming mode. (Can place wet towel over the lid to speed up this process.) When the pin is dropped, the pressure has lowered and you can open the lid. Check the anti-block shield, float valve and exhaust valve (steam release handle) for obstructions. Do not open the pressure cooker until the unit has cooked and all internal pressure has been released. If the handles are difficult to push apart, this is an indicator that the cooker is still pressurized. DO NOT FORCE IT OPEN! Any pressure in the cooker can be hazardous. Do not use an imcompatible (removable) inner cooking pot or sealing ring (gasket) to avoid pressure leakage. Do not cover the pressure valves. 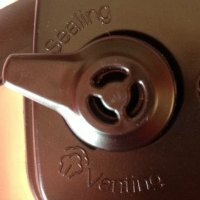 Steam Escaping From Sides of Lid: Push down on lid to make sure sealed closed or turn off the Instant Pot by pressing the Keep Warm/Cancel button and open the lid to check the sealing ring. Make sure the sealing ring is secured. The sealing ring can loosen up from the heat of back to back cooking. Either run the ring under cold water or place in freezer for a while to shrink the ring back to size. I highly recommend to purchase a back up sealing ring to keep on hand. Silicon Sealing Ring Retains Odors: The sealing ring can pick up odors from previous meals cooked. Many people have found good results in removing odors by soaking the ring in denture cleaner solution or washing the sealing ring through the dishwasher. You can also purchase an additional sealing ring to use separately when cooking desserts or sweets. First check the pressure valve to make sure it is closed to the sealing position. Check the Sealing ring- press the Keep Warm/Cancel button and open the lid to check the sealing ring. Make sure the sealing ring is secured. If you have the inner pot too full, it can take longer to come to pressure. See Fill Level guidelines. If you are cooking with tomato based sauces or thicker cream bases, the liquid can burn to the bottom of the pot and not come to pressure properly. Make sure to add equal parts water to sauce ratio. You can thicken the sauce in Saute mode after cooking time has completed. If you are in the middle of cooking, turn off the pot and mix in more water to prevent burning at the bottom of the pot. If the content is already burned at the bottom, pour contents of pot in another container and wash the bottom of the pot. Replace the contents (making sure additional water is added), then start the cooking time again. It is also important after browning meats or cooking vegetables in saute mode, to add part of the liquid portion of the recipe to help scrape up an bits stuck to the bottom of the pot. As we convert more of our favorite recipes by adding pressure cooking instructions, you will find them listed in our Electric Pressure Cooking Index. Keep checking back as this index continues to grow. If you are cooking for a family or 4 or more: I would recommend the 8 quart Instant Pot since you are limited to not fill the pressure cooker pot no more than 2/3 full. I found the 6 quart to make enough for my immediate meal for 4 people, but when I make soups or stews, I like to make enough to have leftovers for lunch the next day or freeze for a later meal. Here’s the link for the 8 quart Instant Pot. I wanted to share some of my recommendations for Instant Pot accessories where I get the most use and I have included Amazon links for easy shopping. I can easily recommend everything but I will list out the first items I bought and used right away and the items that you can order at a later time when you are ready to fix a specific type of recipe. *Vegetable steamer basket: Essential for steaming fresh or frozen vegetables, cooking soft or hard boiled eggs, holding chicken or beef bones when cooking stock. This is an important starter accessory. *Silicon Mitts: The steam from the pressure cooker can easily penetrate kitchen towels or regular oven mitts, the silicon mitts are essential to prevent the steam from penetrating so you can safely removed the cooked food. *Silicon Sealing Ring: It’s great to have a back-up sealing ring as the ring can collect odors from foods you have cooked. It’s handy to have a separate rings for savory and sweet foods. Tip: I have learned soaking the ring over night in denture cleaner works great for removing residual odors. Strainer Basket: The 3 quart stainless steel strainer basket featured in the Amazon ad below fits perfectly in the 6 quart Instant Pot. You need to use pliers to remove the handles before using. If you plan to frequently pressure cook bone broth soup, this strainer basket is much more handy for holding vegetables and meat bones while cooking the stock. You can easily remove the basket to discard the vegetables and bones and then use it for straining the soup stock. I use this basket frequently. Instant Pot Inner Pot: The Inner Pot is a more expensive accessory but it really comes in handy if you need to quickly cook another food item. Just switch out the inner pots in the pressure cooker and you can immediately move one to cooking your next item while your other pot is waiting to be cleaned. I am constantly swapping out my pots when I am cooking several items. It’s one of the first accessories I purchased, but you can hold off to purchase at a later time if budgets are tight. 5 5/8″ Wire Steaming Rack Stand: Your Instant Pot will include a rack stand but it sits about 1/2″ from the bottom. When you are ready to start Pot in Pot cooking (PIP) this wire rack stand will be essential to allow you to cook more than one food item like chicken at the bottom of the pot and a bowl of rice, potatoes or vegetables stacked on top. Click the Go button below the Amazon links to see all the Instant Pot accessories and find this item pull up. 7″ Springform Cheesecake Pan: The Instant Pot makes incredible cheesecakes. When you are ready to start making cheesecake, you will need a 7″ springform pan to fit inside the Instant Pot and allow steam to come up over the sides. Instant Pot Glass Lid: This glass lid is great when you want to use the Slow Cooker function in the Instant Pot. It allows you to see the food that’s cooking and easily remove the lid when you need to stir or check the food. Greek Yogurt Maker: In the 7-1 Instant Pot there is a Yogurt making function. This yogurt maker fits perfectly in the Instant Pot for making and straining yogurt. 6- Cup Bundt Pan: This 6 cup bundt pan fits perfectly inside the Instant Pot 6 Qt model so you can make delicious cakes for dessert and satisfy your sweet tooth.